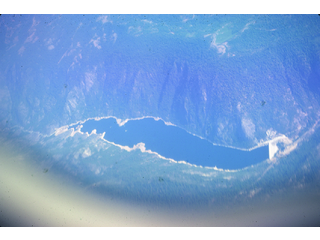 Aerial photo of the Hetch Hetchy Dam and Reservoir. 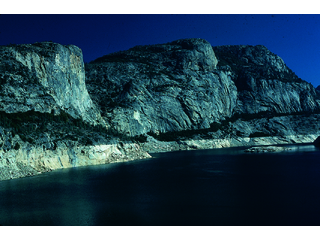 Photo of the rock faces surrounding the Hetch Hetchy Dam and Reservoir. 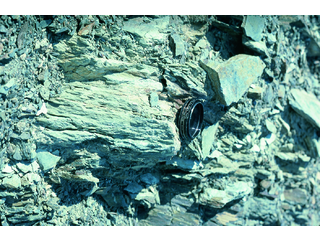 The bedrock is similar to that of Yosemite Valley, primarily granite, grano-diorite and, to a lesser degree, diorite. The low-water mark is evident against the rock face. 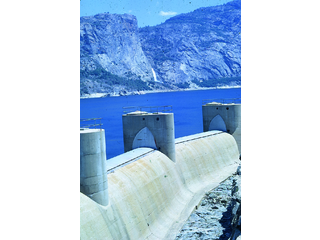 Photo of the top of the Hetch Hetchy Dam, bridge, and parking area, with the reservoir seen in the background. 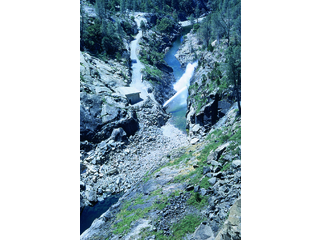 Photo of the Hetch Hetchy Dam face and surrounding rock area with a small stream running through it. Photo of water spraying on the surrounding rock area near the Hetch Hetchy Dam and Reservoir. The granite bedrock is evident in the channel. 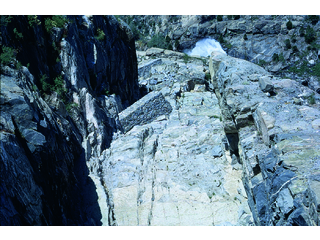 Photo of a high-power water spray onto the surrounding rock area above a narrow stream near the Hetch Hetchy Dam and Reservoir. 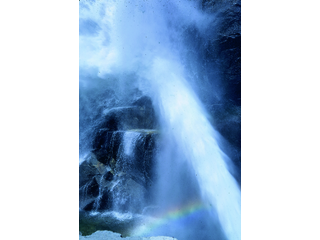 Photo of a small waterfall and rainbow created by the high-power water spray on the surrounding rock area near the Hetch Hetchy Dam and Reservoir. 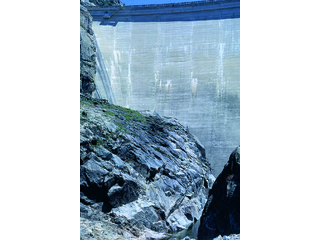 Photo of the Hetch Hetchy Dam and Reservoir. A waterfall is visible on the opposite shore. 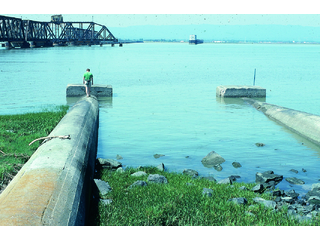 Photo of a man walking on one of the Bay Division Pipelines, which carry water from the Hetch Hetchy Reservoir and aqueduct system in Yosemite underneath the San Francisco Bay and into the city. 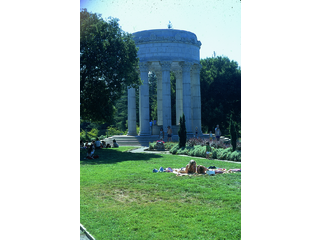 Photo of the Pulgas Water Temple in San Mateo County, where two of the Bay Division Pipelines arrive with water from the Hetch Hetchy Aqueduct system. 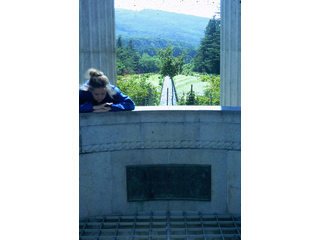 Photo of the interior of the Pulgas Water Temple in San Mateo County. The temple celebrates the arrival of water from the Hetch Hetchy Aqueduct in Yosemite. 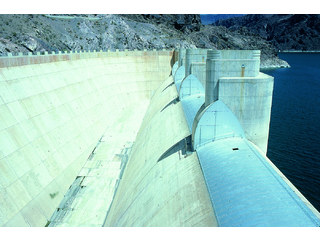 Photo of the Hoover Dam face and Lake Mead Reservoir. 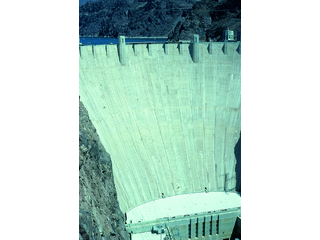 Photo of a section of the interior of the Hoover Dam. 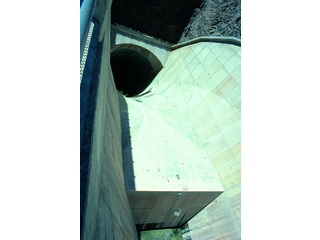 Photo of the interior portion of the Hoover Dam top and bridge area. 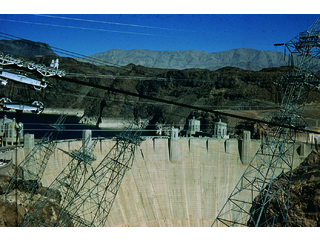 Photo of the Hoover Dam face, specifically depicting the leaning electrical towers and car bridge along its top. 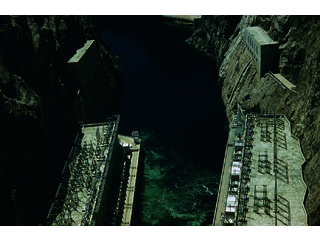 Photo of the Hoover Dam's jet flow gates and power structures. 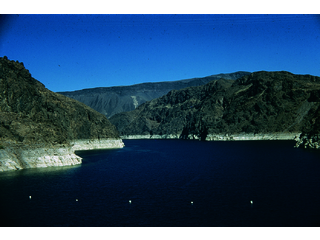 Photo of Lake Mead and the surrounding rock area. 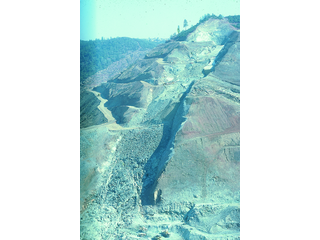 Photo of incomplete excavations at the Auburn Dam site near Auburn, California that was never completed. 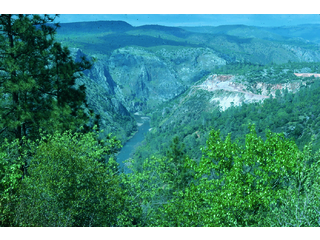 The American River is seen in the background. Photo of water being released from the Glen Canyon Dam in Arizona. 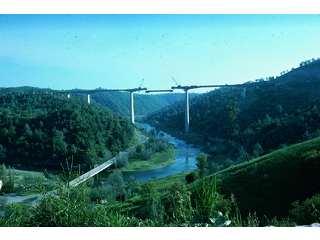 The bridge that spans the the width of the river gorge is seen above the dam. Grand Canyon National Park begins just downstream of the dam. 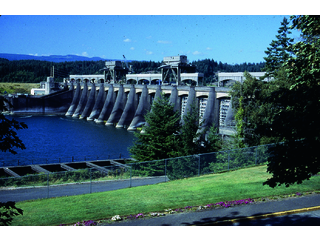 Photo of the Bonneville Lock and Dam located on the Columbia River in Oregon. 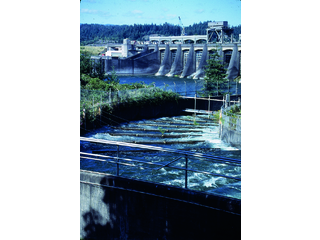 Photo of the spillway at the Bonneville Lock and Dam, which slowly releases water from behind the dam back into the Columbia River. 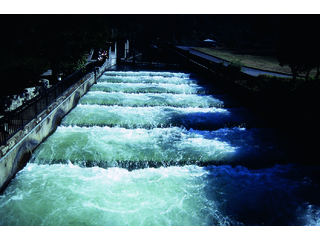 The riffles in the flow act as a ladder for spawning fish that allows them to travel upstream. Photo of people viewing the spillway at the Bonneville Lock and Dam, which slowly releases water back into the Columbia River. 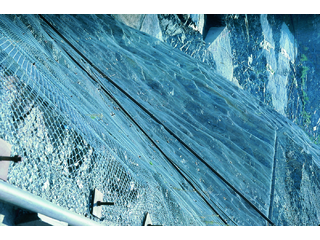 The riffles in the flow act as a ladder for spawning fish that allows them to travel upstream. 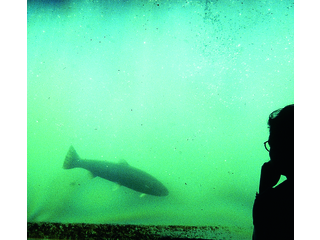 Photo of a woman viewing a fish, possibly in the spillway at the Bonneville Lock and Dam. 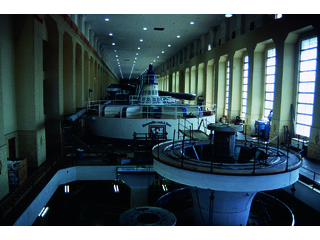 Photo of the interior machines in the power structure at the Bonneville Lock and Dam. 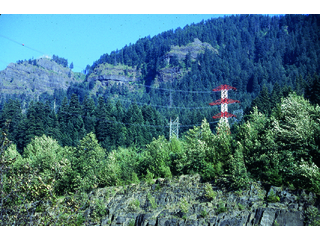 Photo of the electrical towers and power lines in the Columbia River Gorge near the Bonneville Lock and Dam. 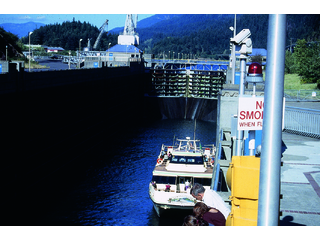 Photo of a boat inside a boat lock at the Bonneville Lock and Dam, which transfers boats along the differing water levels of the Columbia River that are caused by damming. 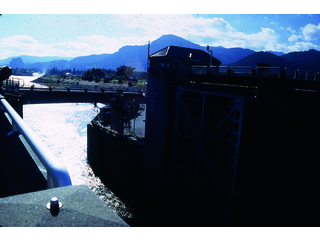 Photo of the boat lock gates at the Bonneville Lock and Dam closing. 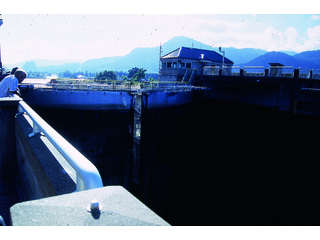 Photo of the boat lock gates at the Bonneville Lock and Dam opening. 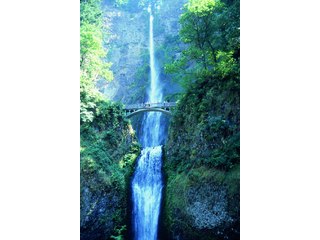 Photo of people on a bridge viewing one of the numerous waterfalls along the Columbia River Gorge. 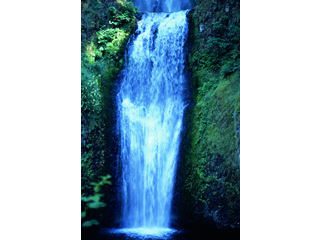 Photo of one of the numerous waterfalls along the Columbia River Gorge. 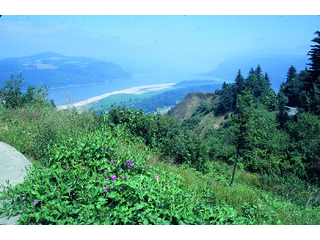 Photo of the Columbia River Gorge taken from the surrounding hill top. 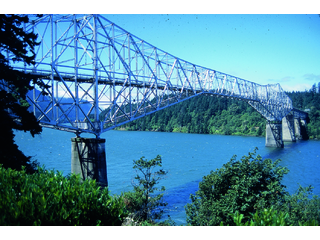 Photo of the steel truss bridge, "Bridge of the Gods," that spans the width of the Columbia River Gorge in Oregon. 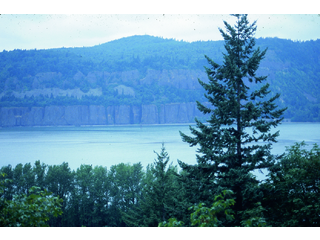 Photo of the river and cliff faces on the Columbia River Gorge. The basalt cliffs are Miocene (17-12 million years ago). The gorge, however, was carved in the Pleistocene period (2 million - 700,000 years ago) and modified by the Missoula Flood (16,000 - 14,000 years ago). 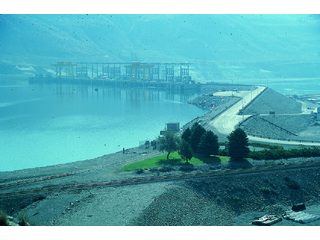 Photo of a dam located along the Columbia River Gorge. 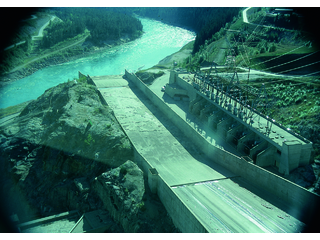 Photo of the Revelstoke Dam located on the Columbia River Gorge in British Columbia, Canada. 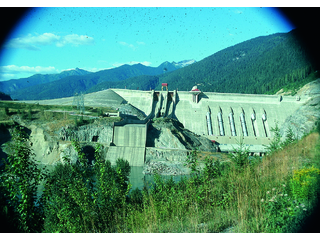 Photo of the Revelstoke Dam, specifically depicting the spillway and hydro structures on its face. 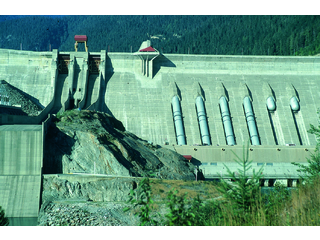 Photo of the Revelstoke Dam spillway, which slowly releases water from the dam back into the Columbia River. 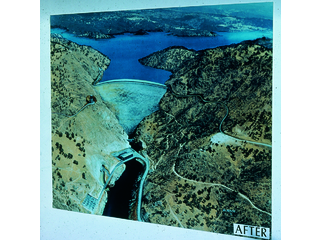 Illustration depicting the dam, roads, reservoir, spillways, and power structures of the Auburn Dam if the project had been completed. Photo of cranes lifting a final piece of a bridge that spans the width of the Columbia River Gorge. 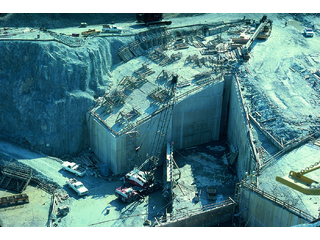 Photo of an incomplete spillway at the Auburn Dam site. 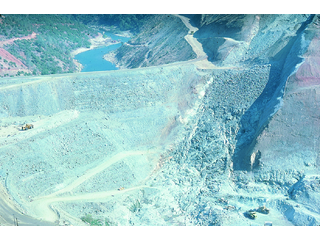 Photo of the incomplete dam face and roads at the Auburn Dam site. 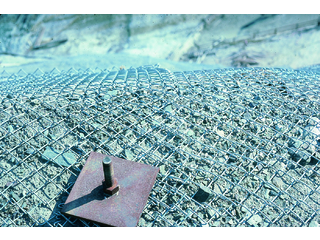 Photo of chainlink nets thrown over the hillsides at the Auburn Dam site. Photo of construction cranes moving building material at the Auburn Dam site. Photo of the rock material in the area surrounding the Auburn Dam site, specifically depicting the rock size relative to a lens cap. 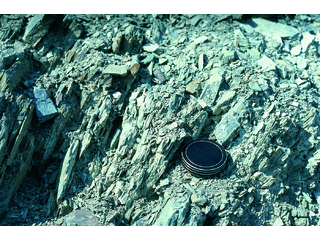 The bedrock is mainly Jurassic/Cretaceous era granitic intrusives, metamorphics, and volcanic tuffs. 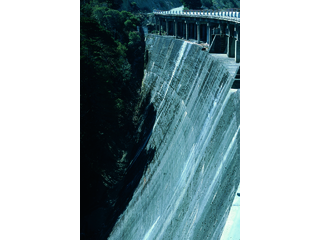 Photo of the Crystal Springs Dam located in San Mateo County, specifically depicting the dam face and overlying bridge. 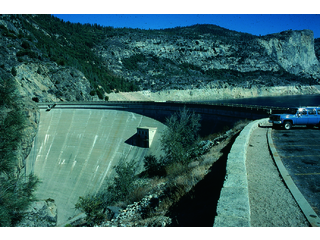 This dam was the first "arch dam" built in California. It predates the famous 1906 earthquake and was undamaged from it despite being within 1/4 mile of the San Andreas Fault (which experienced seven feet of offset at this location, but running parallel to the dam). Photo of incomplete construction at the Auburn Dam site, possibly of roads. 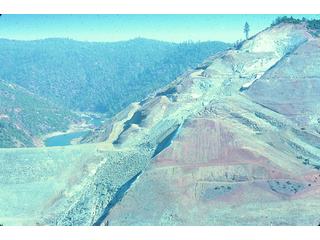 Photo of chainlink net structures thrown over the hillsides surrounding the Auburn Dam site. 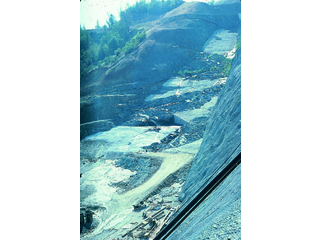 Photo of the rock material in the area surrounding the Auburn Dam site, specifically depicting the rock size relative to a lens cap.